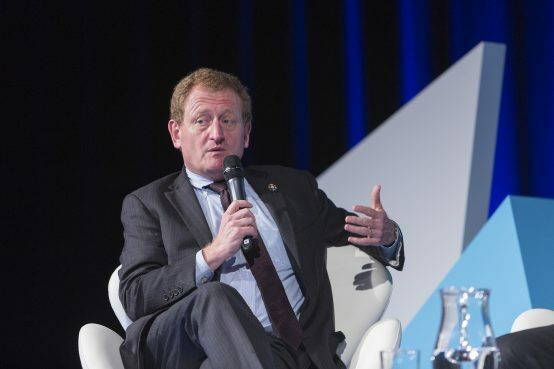 John Roome, World Bank Group Senior Director, Climate Change, speaks at a 2017 event. Credit: World Bank. The World Bank announced its 2025 climate targets in December 2018 at the 24th session of the Conference of the Parties to the United Nations Framework Convention on Climate Change (COP24) in Katowice, Poland, laying the foundations for its 2021-2025 climate strategy. The Bank committed to provide $133 billion in direct finance for ‘climate-related investments’ over 2021-2025, including $50 billion for climate change adaption efforts. It will also seek to mobilise an additional $67 billion in climate finance from other investors, through leveraging private sector investment and de-risking. The Bank launched a new Adaptation and Resilience Strategy in January, which is closely related to the new 2025 climate targets’ emphasis on adaptation finance. The Bank and eight other multilateral development banks also announced they will be outlining the parameters of their joint approach to Paris Agreement alignment, to be announced at COP25 in November 2019. However, despite civil society organisations (CSOs) calling on the Bank to introduce new measures to prevent its finance from going to fossil fuel investments – including an emissions target covering its lending and operations consistent with 1.5°C global temperature rise relative to preindustrial levels – the Bank’s 2025 climate targets remained silent on this point. The surprise resignation of World Bank President Jim Yong Kim – first announced on 7 January and effective on 1 Feb – raised questions about the future of the Bank’s climate work. Kim’s expected successor, US Treasury official David Malpass, is seen as a surrogate of a US administration that has announced its intent to withdraw from the Paris Climate Agreement and has promoted increased export of US fossil fuels as part of its broader ‘America First’ policy, which in the case of the Bank has manifested itself in the US insisting on less lending to upper-middle income countries, including China (see Observer Spring 2019). 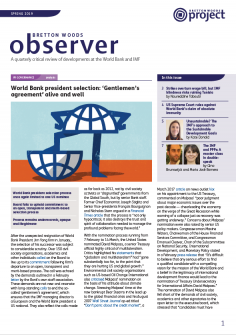 The World Bank introduced a series of commitments at the One Planet Summit in December 2017, including a phaseout of the Bank’s project lending for ‘upstream’ oil and gas after 2019, the introduction of a shadow carbon price in the internal economic analysis of the Bank’s projects, and the tracking of greenhouse gas emissions in ‘high intensity’ sectors (see Observer Spring 2018). It remains to be seen whether the next World Bank president will honour these commitments. In response to these concerns, 31 CSOs submitted an open letter to the World Bank’s Board of Executive Directors in mid-March, calling for the Bank to ensure that alignment with the Paris Agreement is a core priority of the next World Bank president. Can the Bank deliver inclusive adaptation policies?